If she were still alive, my mother would be celebrating her 84th birthday today, July 28. Mom died on Christmas Day 2003, from lung cancer, having never smoked in her life. I miss her terribly. Ten days, 10 years–it doesn’t matter. Her absence is felt. During her life, it was her presence that I and others treasured. She was a wonderful mother, imperfect of course, and I always knew her love for me was unconditional, even as she sometimes wondered at my choices. 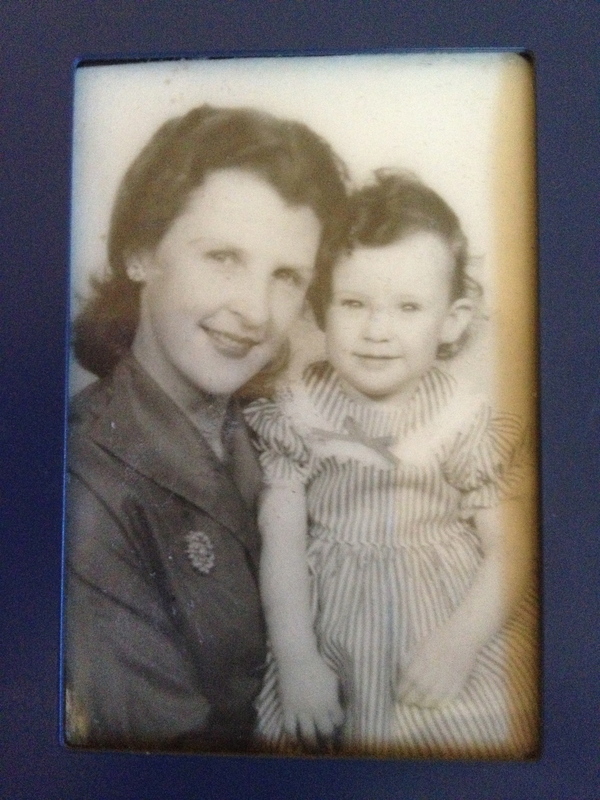 Here’s Mom and me, some 55 years ago. 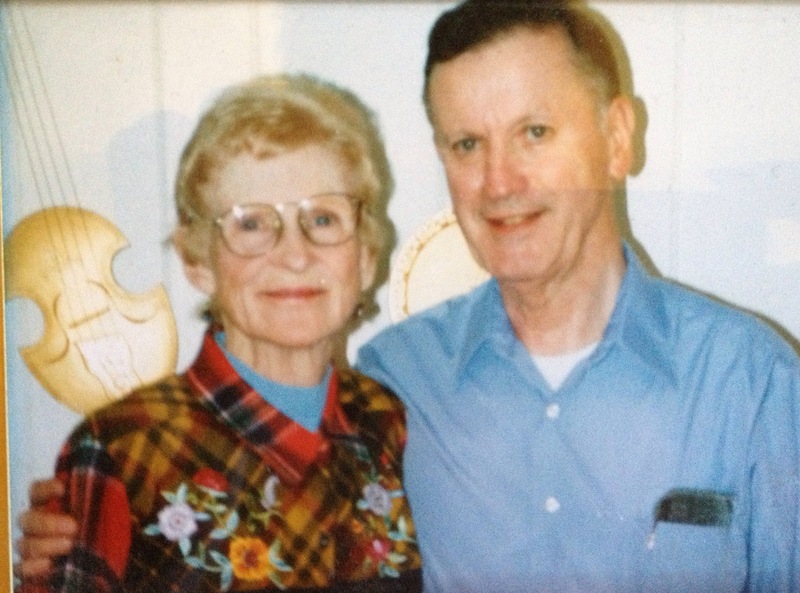 Here’s Mom with my Dad, on her last birthday in 2003, just before they celebrated their 50th wedding anniversary August 8. Dad was a remarkable, humble, well-organized, selfless caregiver of Mom as she got sicker and sicker; lung cancer is a harsh disease. Mom grew up in Massachusetts, the youngest of 4 girls. Her mother was strict, to the point of occasional cruelty. Mom was not that kind of mother. She had trouble conceiving and in carrying to term–I am an only child, and was loved beyond words. Yes, there was discipline in my childhood, but always with thoughtfulness and dignity. When I left Massachusetts after high school to attend Georgetown University in Washington, DC, I now realize how hard that had to have been for my parents, letting go of their only child. They never expressed anything but support and encouragement to me. As a parent myself, watching my children grow up, graduate, take on life’s adventures–that’s what’s made me recognize what they must have gone through. 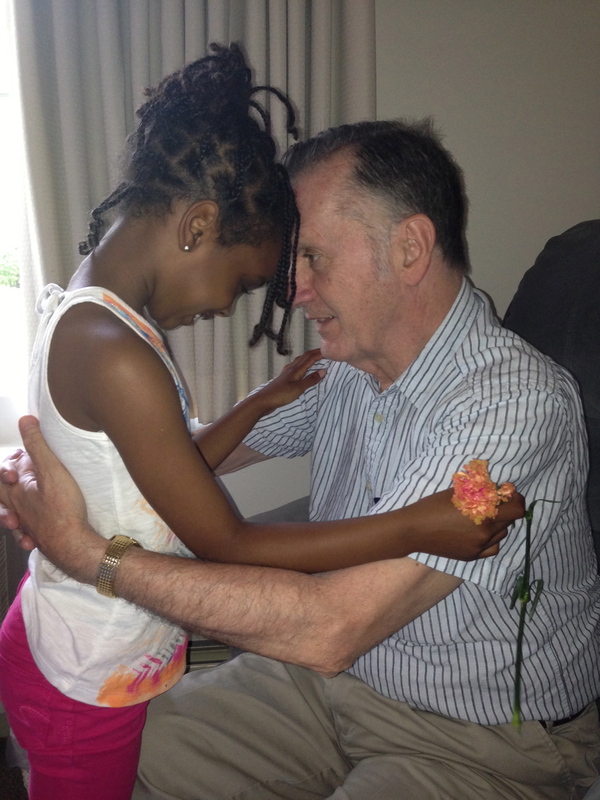 Deciding to adopt, and to adopt transracially, and later internationally–those are big life decisions, and grandparents are affected by them in a big way. Again, my parents expressed support and encouragement, never questioning our decisions, and welcoming each child with nothing but joy. 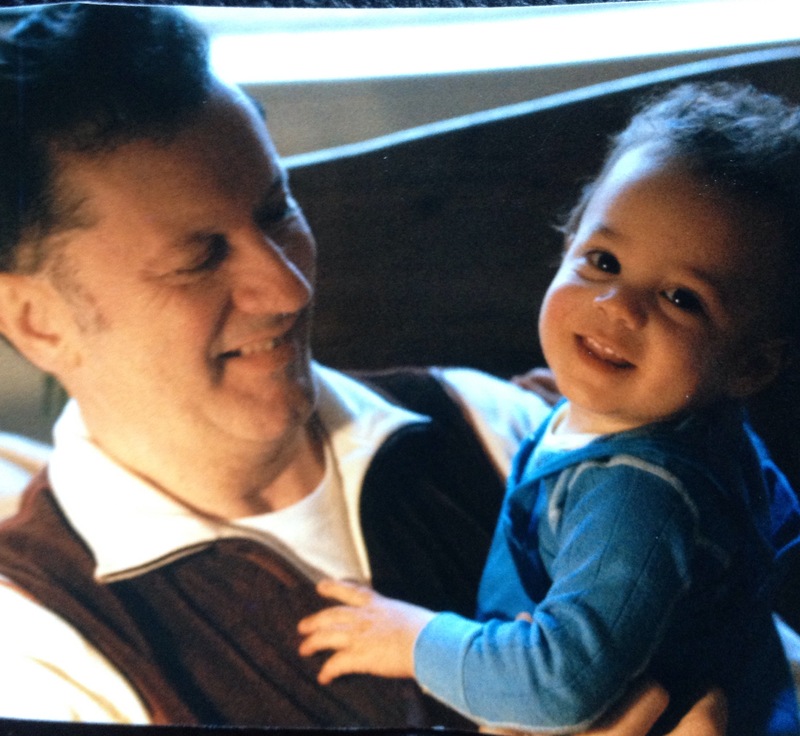 Here’s my Dad with his first grandson, Sean, in 1987. Keep in mind that my parents (and I) grew up in suburbs north of Boston. Diversity was a Polish-American family moving in next to the Italian-American family. Mom became a quiet but firm voice against bigotry at her bridge club. She loved my children as individuals, even as she became increasingly aware of the realities of racism in this country. 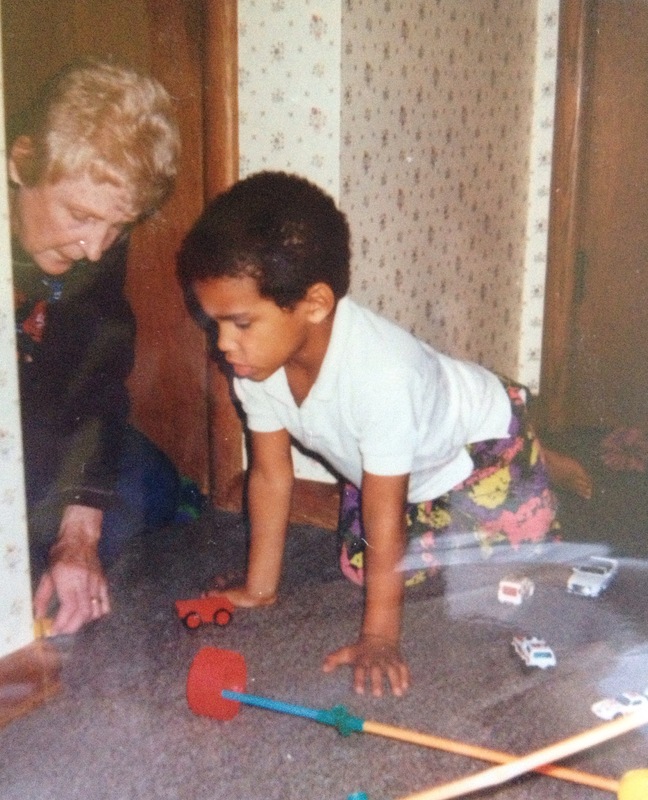 As this 1990 photo shows, Nana was a down-on-the-floor grandma, taking Legos and toy cars as seriously as her grandson Christopher did. 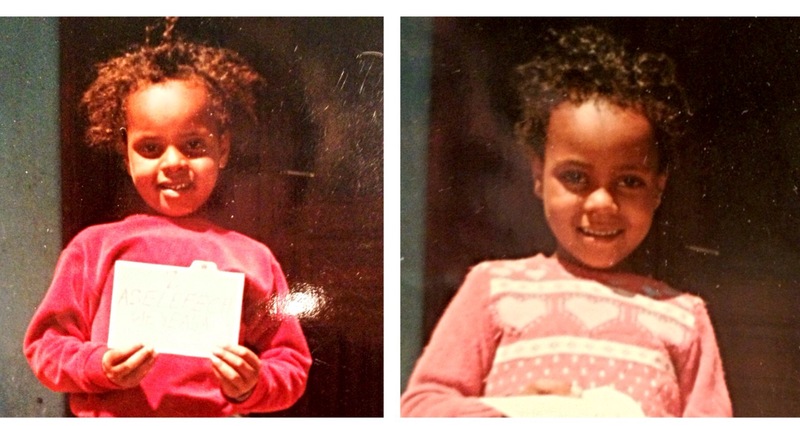 When we decided in 1994 to adopt twin 6-year-old girls from Ethiopia, my parents may well have wondered if we really knew what we were getting into. Besides their African-American grandsons, my parents knew only a few people of color, and certainly no Ethiopians. When they saw the referral photos from the adoption agency in 1994, they fell in love, and never looked back. 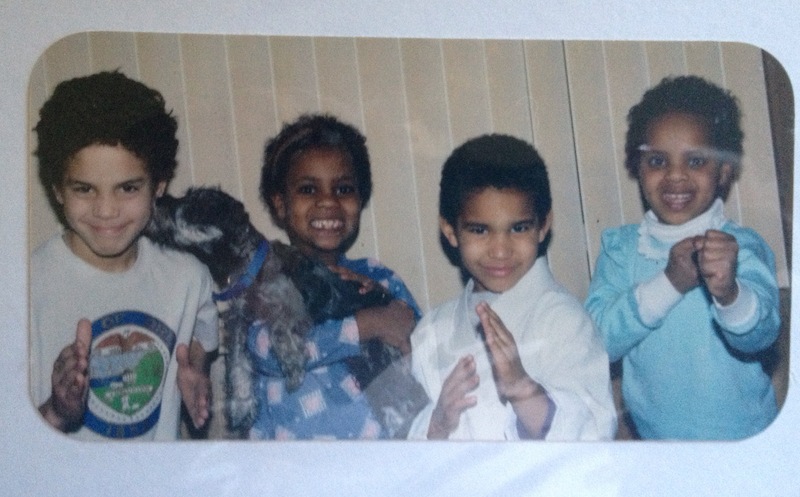 Here is one of Mom’s favorite photos of the 4 kids, taken in 1995 about 6 months after Adanech and Aselefech arrived. The kids were 8, 6, 5, and 6 years old at that time. The dog was a puppy. Mom was an excellent shopper, and always got incredible bargains at Macy’s or Nordstrom’s, especially for Aselefech and Adanech, as she had done for me when I was growing up. She was lavish in sending gifts to each grandchild on their birthday–I’m talking about a big box with individually wrapped gifts, and a carefully selected card with a thoughtful message. This was true from the kids’ birthdays from age 1 through their teens. It was true of mine into my 40’s. We think of Mom on our birthdays, and today, on hers. Aselefech became a mother herself in 2006. Oh, how my mother would have adored her smart, sweet, athletic, fun great-granddaughter. Here’s Dad a couple of months ago, with his great-granddaughter. They truly have a special bond. I first became a mother to my older son in 1987. I became a mom again in 1988 to my younger son, and then in 1994 to my twin daughters. I became a grandmother in 2006. Each one was a dream come true. We have had our fair share of sad, complex, troubled, dark days. And we have had so many more days that are light- and laughter-filled. I write in this blog (and many other places) because becoming and being a mother means so much to me. I know that losses had to happen for my gain. I am a strong advocate for transparency and integrity in adoption. 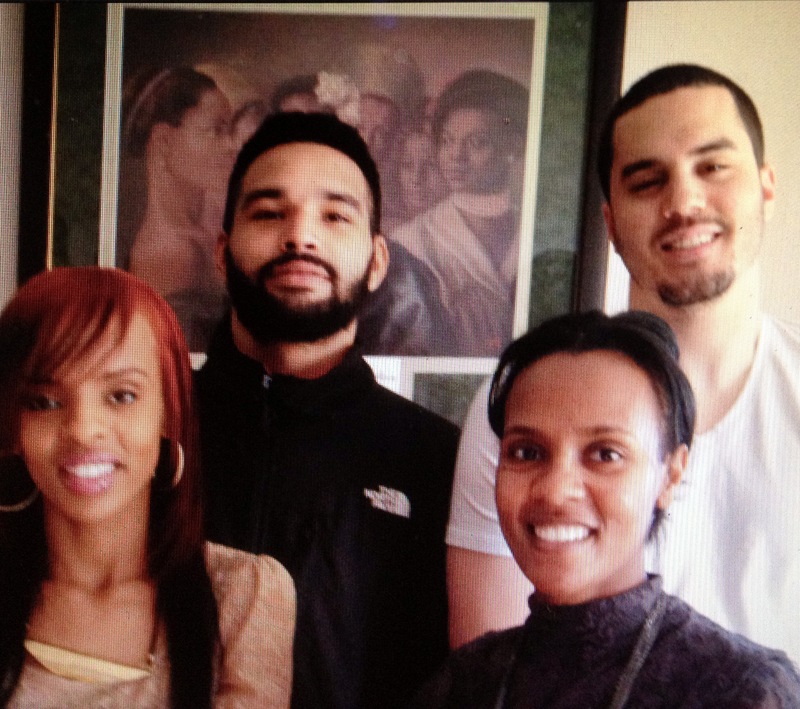 Were it not for adoption, with all its complexity, I likely would not have been a mother, and certainly not to these awesome, incredible children, now all young adults. They would not have known and loved my mother, who loved them so deeply and so well. And this is also why, as an adoptive mother, I am attending the Williamses’ trial, and writing about it. I do not want that little Ethiopian girl, Hana Alemu, to be forgotten. What, per my blog title, is it that Hana never got? She never got the chance to grow up, and the possibility to be a mother. I do not take for granted that I had a mother who loved me. I do not take for granted that I am a mother, and a grandmother. Happy Birthday, Mom. I know you’ve got Hana under your wing. May you both rest in peace. This entry was posted in adoptive parents, Ethiopian adoptees, grandparents, Hana Alemu, Hanna Williams and tagged adoption by Light Of Day Stories. Bookmark the permalink. Hello Maureen. I came across your blog by accident having read about it in a German blog on ethics of adoption. Me and my wife have the opportunity of giving an Ethiopian child the chance to achieve all the things you so lovingly describe. With that in mind, I would like to thank you for covering this case and exposing the things that are so foul about adoption (and mankind maybe) – and thus help Hana not to be forgotten. What a sickening story. Pingback: Thoughts on the Williams Trial | Why Not Train A Child? Maureen … this posting filled me with emotion. Just having returned from San Diego where we visited my 81 year old mother and 78 year old father, the loving grandparents Aster adores and now rarely gets to see, your honest details enrich me. Your writing in this post is meaningful and magnificent. I feel somewhat at a loss of words. For that, tonight, I give thanks.